These are the best homemade taco salad recipes from scratch. 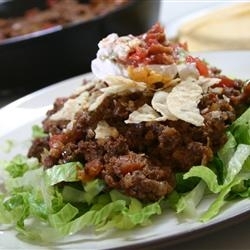 round beef taco salad can be made with chicken or turkey. I also offer a recipe for layered taco salad at the bottom of the page. Offering an easy tortilla chip recipe, fresh salsa and guacamole from scratch and homemade taco seasoning below. Brown and drain hamburger. Add taco seasoning to the browned hamburger mixture, lettuce, tomatoes, olives, cheese and onions. Just before serving, stir in crumbled Doritos and mayonnaise mixed with 1 cup of taco sauce. Cut off the tops of the green peppers and remove seeds. Cut off the tops of the jalapenos but do not remove seeds. Cut the outer skin off the onion and cut in four sections. Place these items in a food processor and run until everything is small. I usually do not leave big chunks of the jalapeno as small chopped bits blend better and give flavor throughout the salsa. Wash the tomatoes and cut off the tops and cut them in half our fourths and put them in the food processor with the garlic clove on top of the already chopped up peppers and onions. Process these until the tomatoes are well chopped. Open the food process and remove the container and put a strainer in your sink and pour the mixture from the processor into the strainer and let strain all the excess liquid from the tomatoes. Add the remaining ingredients and stir. Cover and chill. This is another tasty recipe for fresh salsa. Your friends and family will BEG you for this recipe Wonderful addition to my taco salad recipe. Combine ingredients and refrigerate for at least 4 hours to marinate. Makes approximately 2 cups. Less fat than fried, these are wonderful with my recipe for fresh salsa. Great taco salad recipe. PREHEAT oven to 425 degrees and grab a cookie or baking sheet. Place the tortillas on a cookie sheet and spray with Pam, then sprinkle with seasoned salt. Turn them over and repeat.